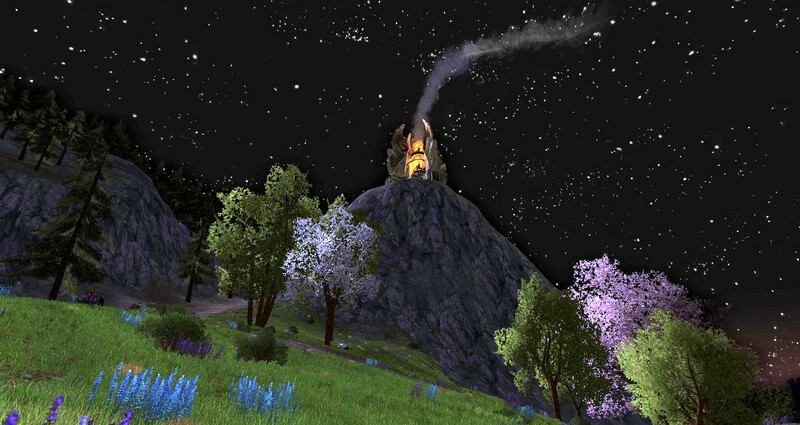 The long, slow march to Mordor continues onward in the Lord of the Rings Online. Turbine is following the story as it progresses east and south - and underground - into the fabled land of Gondor with Update 14. We got a guided tour with Turbine staffers showing us what Update 14 is all about. This update brings more than just a few new maps - even though those maps are outstanding, and have been on players' minds for a long time. Particularly after being teased with the Black Door with the Helm's Deep expansion. Well, the good news (or maybe the bad news, depending on how you want to look at it) is that players can now walk the Paths of the Dead and see the ancient underground city of the Oath-breakers. 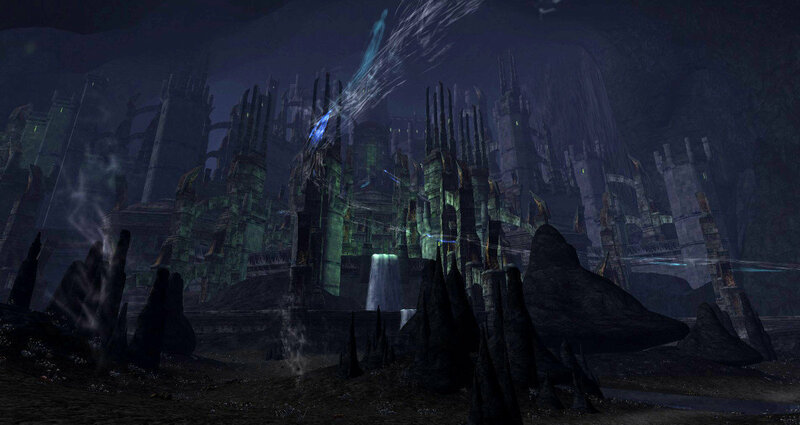 As for Gondor itself, it is lush and beautiful and as rugged as the people who call it home. And not just in the landscape, but in the architecture as well. We got a hint of the Gondorian style of architecture with the Hornburg, which is a Gondorian-built fortification housing Rohirrim squatters. Now we get to see it in its native environs. According to Executive Producer Aaron Campbell, "These are not the sort of almost temporary structures of the Rohirrim. There's some size and weight to Gondorian structures - we date back to Numenor, we date back to a lot of that ancestry, so a lot of that ancient feeling finds its way into the Gondorian space as well." It should come as no surprise to anyone that war has come to Gondor, and the storylines that players will experience in the new areas show it. The White Hand of Saruman is thoroughly vanquished at this point in the player's journey, but Sauron is still cranking out the evil from Barad Dur, far off in the east, and Gondor is his gateway to the rest of Middle-earth. By the time the player arrives in Western Gondor, the flames of the beacons have already been lit, summoning the lords of Gondor to Minas Tirith, where Sauron means to focus his assault on the realm of men. "Most of the fighters of Western Gondor have already left for Minas Tirith, and they've brought a lot of their fighting men," Senior Content Designer Jeff Libby explains. "Imrahil, the prince of Dol Amroth, has already left with his hundreds of Swan Knights to go to the defense of Minas Tirith. But the Corsairs of Umbar, who are threatening this area, they know what the beacons mean. They know that's Minas Tirith calling for aid, so they know that a lot of the fighting force that could defend Belfalas and Lamedon, that could defend these places, is gone, so they're taking advantage of it. Kind of a double-edged sword here." Of course, we probably won't be seeing Minas Tirith anytime this year. Update 14 is a transitional kind of update - still moving away from the homey hobbit quests and into darker, increasingly-war-focused. Minas Tirith is a critical piece of the story, bigger even than Helm's Deep, and the dev team has already built and discarded three prototypes of it so far. We won't be seeing Turbine's version of that iconic city until 2015. For now, we get Western Gondor, which will be enough story content to get players from the current level cap of 95 up to the new cap of 100. 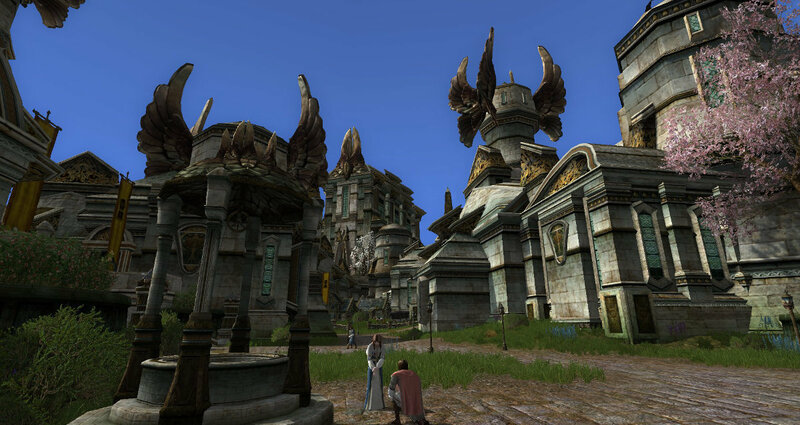 And with this update and the new level cap comes a new set of repeatable "capstone" quests, and a 6-man fellowship area near Belfalas where players can band together for fellowship quests. The return to more group-oriented content is mirrored in the first new Volume 4 epic book, where players are given the option for solo or group instances. 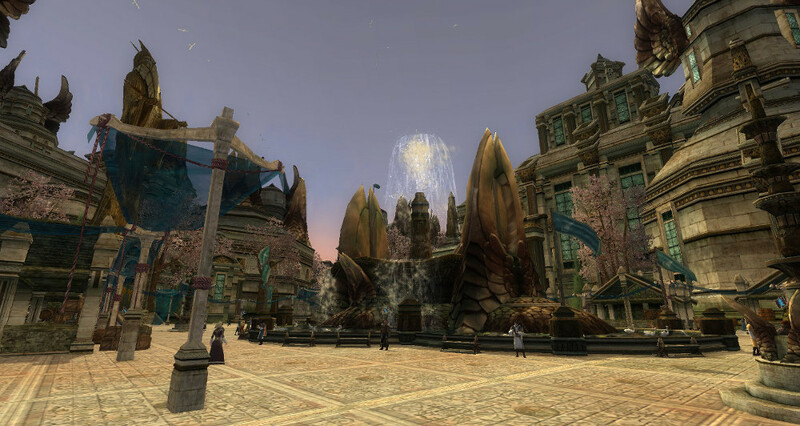 This harkens back to the Volume 1 instances set in Angmar and elsewhere, and us old-timey players will be struck with nostalgia when we see all the Reflecting Pools located throughout Western Gondor. Update 14 will also introduce a new system of armor customization with slotted armor. While this system is still undergoing major retooling and tinkering - the dev team didn't want to show off the unfinished UI for this new system yet - it has been implemented on the Bullroarer test server with the intent on delivering it with the rest of the update. "We're debuting a new item system," said Matt Zimmitti, Lead Systems Designer, "where players can customize many of their pieces of armor. We're calling it the Essence system - basically, you can find a piece of armor with slots in it, and then you can either craft or find Essences which correspond to 17 of our stats. There are the core ones like Might and Vitality, and everything down to things like Critical Rating, Critical Defense, and you'll be able to put together your own stats in pieces of armor. "For Update 14, it's kind of a mini-launch of it; we want to get it into some players' hands and see how it plays out before we decide on a full version of it. We've always gotten a lot of feedback when we build gear for folks that, you know, 'This piece would have been really great if it had had this stat, but it doesn't.' So we're really at a point where, the world is gearing for war, we might as well put a little bit more tools in the hands of the players to actually gear up themselves. So we're really excited about it. The Essences that go into gear can be found in a variety of places, and it should be a lot of fun. Anything from skirmish-tier gear all the way up to really, really high-end stuff depending on how many slots it has in it and how many stats you can put in it. We're pretty excited about that." 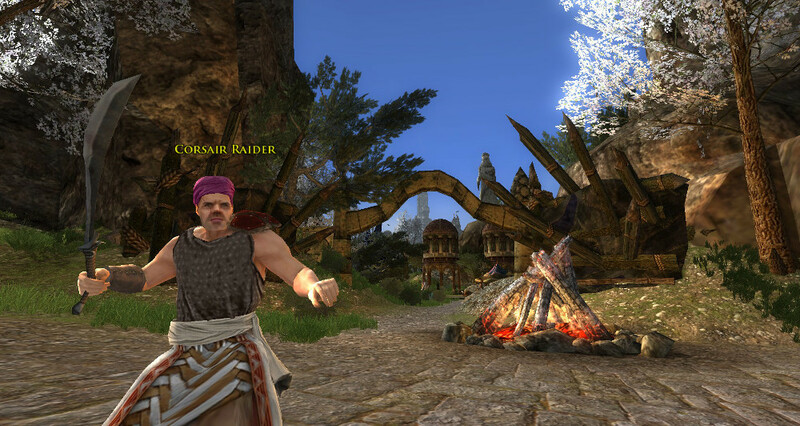 This system has been kicking around in MMOs a lot recently, and Turbine decided it would fit just fine in LotRO. It brings to mind the custom orange gear in Star Wars: the Old Republic - each piece is more or less an empty shell to fill with the mods you pick to make your own custom armor. It's not exactly the same, though - the LotRO slotted armor pieces have set armor ratings dependent on the level of the piece. In SWTOR, a character could pick up an empty orange armor piece at level 1 and use it all the way to level cap and beyond, swapping out the mods every so often to keep it current with his level. 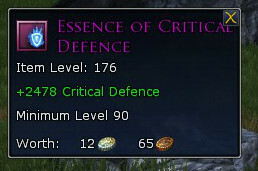 LotRO's slotted armor comes with a set of fixed armor rating values, but slots for Essences that can add stats and bonuses to the piece, but not increase its armor rating. So a theoretical level 1 slotted armor piece will only be really usable for slightly longer than an un-slotted armor piece of equivalent quality, even if the player keeps swapping in new, more powerful essences. Unless that player considers armor rating to be unimportant. But still, it will be very rare to see level 95 guys wearing a level 10 slotted chest-armor. On the other hand, level-cap slotted armor will be highly customizable and will enable players to move outside of the restrictive endgame gear sets that currently exist. Raiders will be able to custom-tailor their gear to best match their playstyle, instead of having to cherry-pick from a handful of endgame armor sets. However, this system is not intended to completely replace the existing top-tear gear. "We're basically making the Essences system additive right now," Matt Zimmitti explained. "We're trying not to replace classic armor sets that have set bonuses and very specific stats on them. What we want to do is put in there in such a way that even if you have a really cool set with a lot of bonuses that you like, generally it's a 6-piece set but you only need 5 to fill it out - like, you might replace the helmet in it and keep your set bonus, but then tweak your stats just on the helmet. We just want more customizability out there." In its current form on beta, the Essences for slotted armor are very rare loot drops from landscape mobs, but this will be expanded at launch, dependent on player feedback. Plans are in place to also make Essences craftable by all professions, to add them as event rewards and a number of other ways. The more potent Essences will be more challenging to acquire. The team will be focusing on the rest of Gondor for the next little while. They have plans to open up Pelargir later this year, then move into the besieged ruins of Osgiliath next year, and then continue into Minas Tirith after that. "Every update, our players tell us it's the most beautiful region they've ever seen, the most beautiful area, and every update we push the bar. So I think we're going to continue to move on that front," said Aaron Campbell. And the next update will be another one of those moments players have been waiting for: Update 15 will see the introduction of the Beorning, the first new character class since the Warden and Rune-keeper were introduced with the Mines of Moria expansion. Update 14 is in open beta on the Bullroarer server now, and is set to go live on July 14.